Review! The Cookie Button Ring! I was sent a gorgeous ring from Sammi from thecookiebutton.blogspot.co.uk. 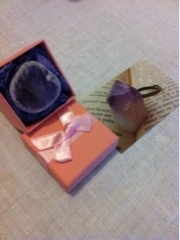 The ring came in a pretty pink box with a pink bow, I opened the box to find some purple tissue paper protecting a huge purple crystal ring! The purple crystal is stunning and looks like a heart! It sparkled and dazzled! I loved it! The crystal was attached to an adjustable band, the crystal is super heavy so I had to tighten the ring band. The ring is so pretty and unique, I would wear this out and about and would recommend Sammis shop! 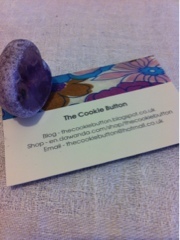 Have a look at Sammis blog and shop everyone! Glad you like it lovely one! It looks so cute! xoxo. That's gorgeous! I love large jewellery, will definitely check out the shop. 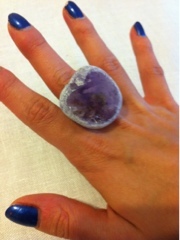 That's such a gorgeous a ring Alessia! wow, what a gorgeous ring! My 2012 and Christmas Surprise! Christmas! How do I celebrate?